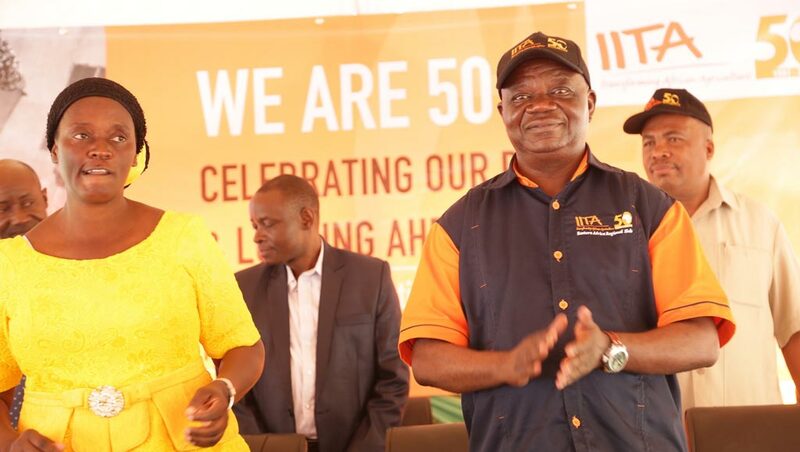 IITA’s 50th anniversary celebration moved to its Eastern Africa hub in Dar es Salaam, Tanzania with an exciting two-day program on 11-12 July. The first day brought together major partners and all staff from IITA stations in Kenya, Tanzania, and Uganda to mark this important milestone. The event was graced by Ms Nkuvililwa Simkanga, the Director of Policy and Planning, who represented the Minister of Agriculture, Livestock and Fisheries in Tanzania; Dr Hussein Mansoor, the Director of Research and Development in the same ministry; Hon. Christophe Bazivamo, the Deputy Secretary, Productive and Social Sectors; and His Excellency Paul Cartier, the Ambassador for Belgium in Tanzania. 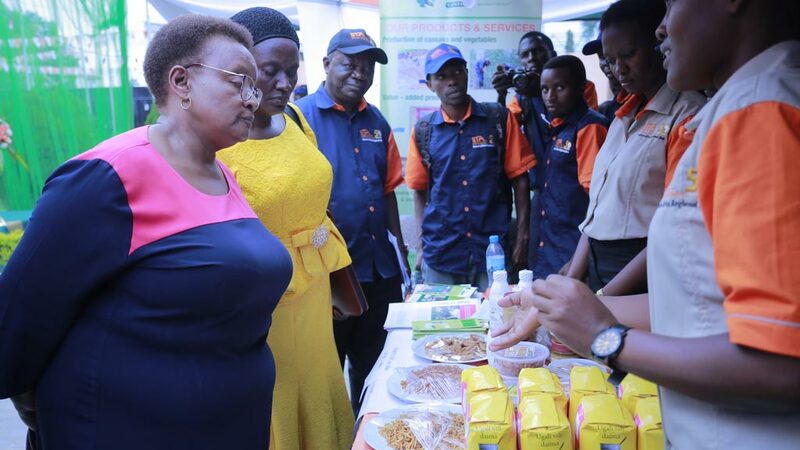 Mr Fred Kafeero, Country Representative for FAO, and Dr Betty Maeda, Agricultural Research Specialist, USAID Mission in Tanzania, were the other notable dignitaries at the event along with representatives from national research institutes, universities, private sector, farmers, and the media. With the theme “Celebrating our past and looking ahead”, the program combined plenary presentations, poster exhibits, and product exhibitions during which the staff showcased the Institute’s progress and achievements and shared plans. The Minister, Hon. Dr Charles Tizeba, in a speech read on his behalf by Ms Nkuvililwa Simkanga, Director for Policy and Planning, congratulated IITA for this important milestone and thanked the Institute for its efforts in finding sustainable solutions to some of the critical challenges facing smallholder farmers in the country. These include lack of access to improved varieties, lack of modern agricultural production skills and knowledge, attack by pests and diseases, and postharvest losses. Simkanga reading the Hon. Minister’s speech. “I take this opportunity to applaud IITA on the various successes it has had in addressing the challenges faced by smallholder farmers; from developing improved varieties of major crops such as cassava and banana and spearheading efforts to commercialize agriculture,” he said. He noted 20 improved varieties of cassava that are high yielding and disease resistant had been released in Tanzania in the last 10 years from efforts by IITA and the national breeding team. IITA’s efforts to control aflatoxin contamination in food and feed in the East African Community region and in Tanzania were noted as major achievements of the Institute by Hon. Bazivamo from the EAC secretariat and Dr Betty Maeda from the USAID Mission in Tanzania. “I take this opportunity to acknowledge in a special way the contribution that IITA has made in the EAC integration process. IITA has provided tremendous support in implementing the aflatoxin prevention and control project. With IITA support we have been able to develop a robust EAC aflatoxin and prevention control strategy and action plan aimed at addressing the effects of aflatoxins along the food and feed value chains with the associated health, economic, and farm level benefits,” he said. Maeda highlighted the joint efforts between IITA and USAID in building the country’s research capacity and addressing aflatoxins. “Together we have strengthened national research institutions paving the way for improved research products and services. And together we have built a lasting relationship by establishing partnerships with the donor community and local government and farmers’ organizations to allow technologies to reach the beneficiaries,” she said. She said for the last four years, USAID had supported IITA to carry out research to develop aflasafe, a biocontrol product to address aflatoxin contamination. She said the biocontrol product was awaiting official registration to be commercially available for use. 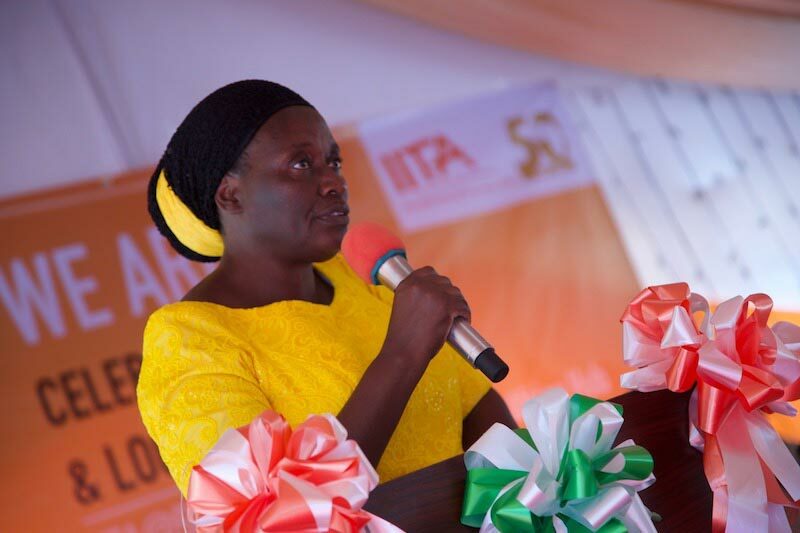 She said USAID had also provided funds to IITA for sensitization and awareness creation of aflatoxins that had seen hundreds of farmers as well as researchers and extension staff trained. The afternoon session of the program took the guests and staff on a speed date with scientists representing the key research themes at IITA. These were Crop improvement and biotechnology led by Leena Tripathi, Plant health led by James Legg, Social science and agribusiness led by Shiferaw Feleke, Natural Resource Management led by Danny Coyne, and Partnership and capacity development (PCD) led by Regina Kapinga. The teams shared their successes in Eastern Africa with the guests and visiting staff who went on a 20-minute “date” with each of them. The speed date was highlighted as another exciting program of the event that all participants appreciated.